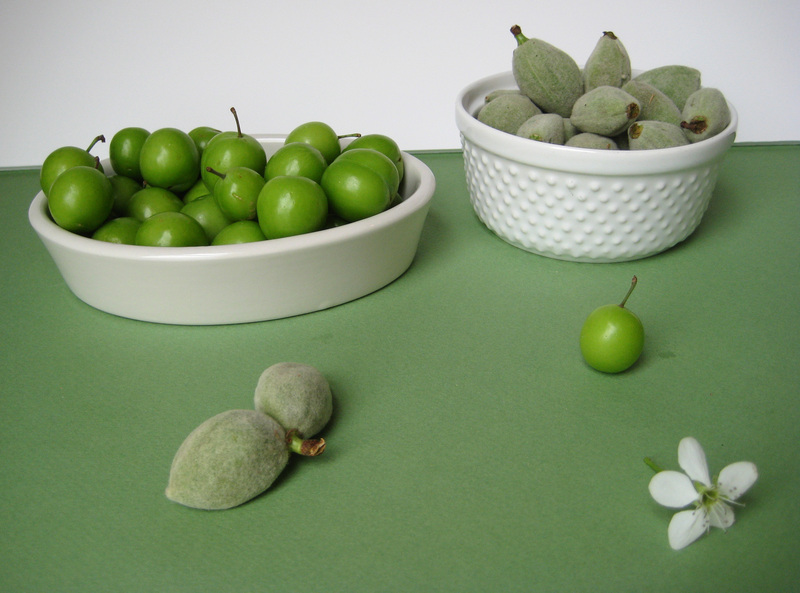 Pictured here is what we call chaghal’eh badoom in Iran — known as fresh (or green or spring) almond here in the U.S., that is if you can find it. 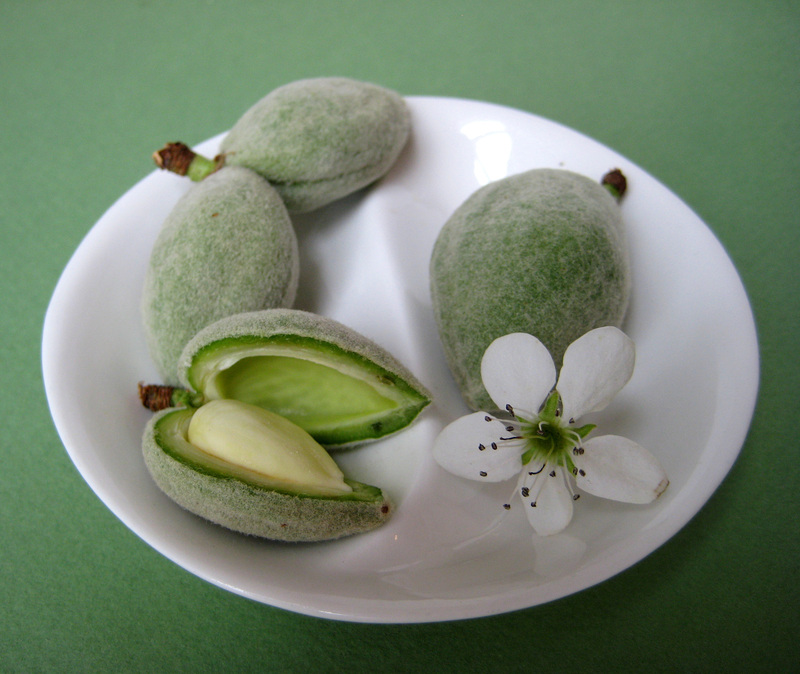 Nestled inside its fuzzy green hull lies the young skinless almond, sleeping the sleep of the just – not yet hardened and soft in texture. Chaghal’eh badoom arrives on the scene in early spring in Iran for a mere few weeks — greeted virtually by delighted clapping of hands — just like its kindred spirit and friendly rival, the other favorite Persian bounty and symbolic synonym of spring: goje sabz. That’s right! You eat the whole kit and caboodle. Only the stem remains! Chaghal’eh badoom is crunchy with a soft center, tastes somewhat like a quite tartly-delicious apple, and makes for a very refreshing and nutritious (not to mention addictive) snack that is also wonderful in a salad or as a garnish to brighten up a meal. I recently met someone who informed me that in Turkey it is customary to pile a plate high with spring almonds and eat them (sprinkled with salt) while drinking beer. Which actually makes perfect sense taste and texture wise — I can imagine that the accompaniment of sat and crunch and fresh burst of tangy flavor is a very pleasant chaser for beer. I predict that a hip NY or Brooklyn bar will get wind of this soon enough and offer these ! Goje sabz and chaghal’eh badoom are also used to make khoresh and preserves and some-such in Iranian cuisine but since they are scarcely available here, I am reluctant to cook them and prefer to enjoy them in their natural glory and savor their unique refreshing burst of taste and ultra-satisfactory crunch that needs nary an embellishment save for the sprinkling of some salt. 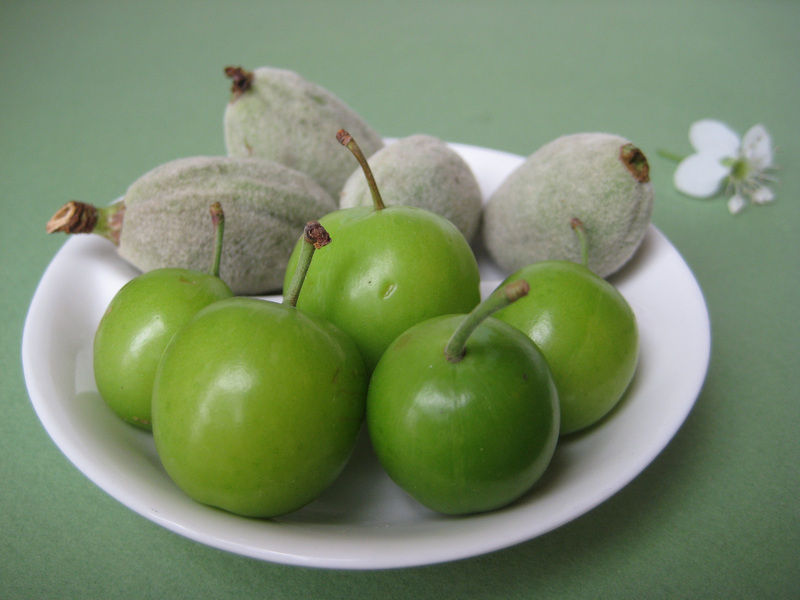 Who knows how the idea of eating unripe almonds and unripe plums got started but whoever got the ball rolling created a fad that has lasted for thousands of years! Once you experience the fresh and crunchy taste of the spring almond and sour green plum for yourself I reckon you’ll jump on the bandwagon as well. Happy Earth Day. Life is our gift. Earth is our home. ps. Coming attractions: Halva (a type of Persian sweet that is made with rosewater and cardamom and other nice things) recipe post + how to make homemade rosewater! Stay tuned. Azita, this brings back wonderful memories of travelling in the North of Iraq in early May a couple of years ago. 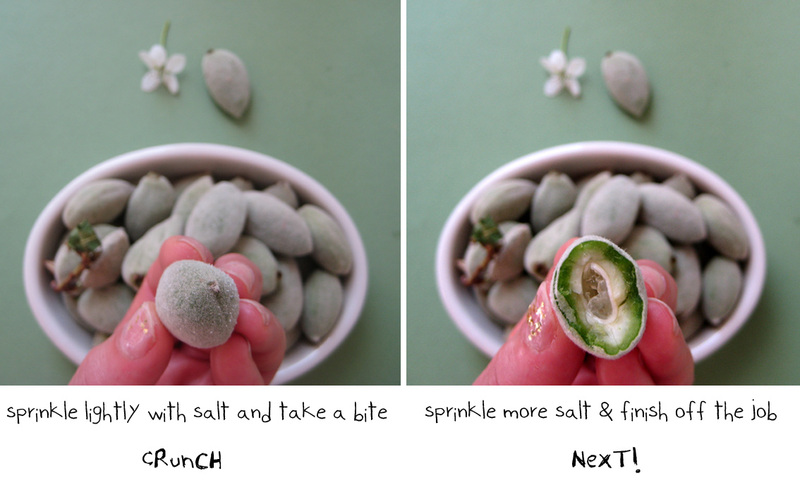 We would grab some almonds and dip them into a little bag of salt, at first it was strange, but then I grew to love it! We did the same with wild rhubarb as well (after peeling). Nobody told me that you were supposed to do the same with the plums, as a result, I never really learned to like them! Will know how to try them next time I go (if I ever go back). Darya, That’s so interesting and I didn’t know at all about eating wild rhubarbs. I just Googled images of it. Those must be particularly tart. Give me sour and salty and crunchy and I’m smitten. You are an adventurous traveler, aren’t you! Thank you for sharing your story, I love tidbits like this. Gorgeously fuzzy, I want some just to hold! Where do you find such things? they ARE fun to hold, and look like little itty bitty cute things. I found these at Sahadi’s in Brooklyn and Kalustyan in Manhattan also has some. gorgeous photos and wonderful descriptions! Beautiful photos! I saw those fuzzy green olives at the fruit stand around the corner and wasn’t sure what to make of them. I think I need to run back and get a bag before they’re all gone! Those are exsquisite looking! I wonder if they might be found in a local middle eastern market I saw . . .
Let’s hope so. If they don’t have it, ask them to stock up. They will if there’s a demand for it. The photo’s are amazing!!! You eat the whole almond??? How is the fuzzy feeling in the mouth? 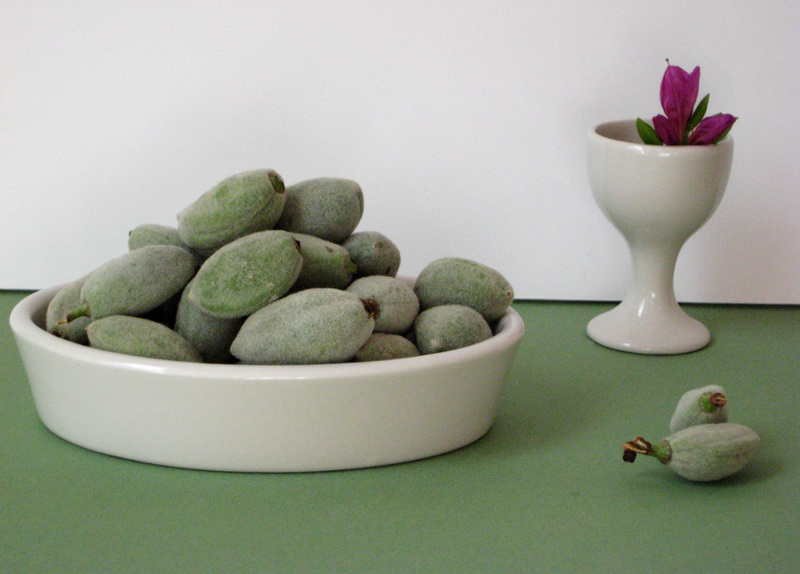 I am sure they are delicious, I love raw green almonds but never thought to eat the whole thing. Amazing!! Yup! You eat the whole thing. The tongue definitely senses the fuzziness but it’s very subtle and pleasant – so it’s not like putting a hairball in your mouth and combined with the crunchy contrast and very fresh, raw and tart taste of the inside, the whole thing together combines into a pleasurable bite. I just heard from an interesting woman I met that in Turkey they eat these while drinking beer, which makes perfect sense actually. Someone should pitch the idea to a hip bar! Good idea, take some with you to bar, people will ask what you are eating and maybe the idea will catch on. Your photographs are so beautiful. A real feast for the eyes. Wow, I’ve never seen them before. As I adore almonds I’m sure to love ’em. However, unripe plums is probably pushing it. I’ve had an authentic Keralan sour mango curry and wasn’t overly keen. Nice color palette for Earth Day! ha ha! Hope you find some Ahu jan! Oh, I wish I could try these! Beautiful photos! They have only within the past decade made an appearance in specialty international groceries in NY and also in the DC area and I’m pretty sure perhaps in LA as well. Why not reach out to your local mid-east store and ask them to stock up next season? Until then, a nostalgic trip down the memory lane is not too painful I hope! Oh dear! I got an image from “Northern Exposure” flashing in my head 😉 Next bi-annual shopping trip you make, if you’re up for sharing pix of your loot, I’d love to see pictures and maybe share the image on this blog.. if you like. If you scroll to thebottom, you can see what I bought! deep-fried grasshoppers? hmmm, not that adventrous myself but can totally see it becoming a “thing” ha ha. Laura, I wish I could send a bushel to taste. One day technology will catch up to food-bloggers comraderie and desire to share things with each other! I wait for spring to enjoy these wonderful short lived green treats. Hi, thank you for visiting and commenting! I used to think eating these was strictly an Iranian thing but have come to realize so many countries share the passion. I’m glad you can find these were you are! Oh wow- I’ve never heard of either of these before. But I’ll keep a lookout for them at my local farmer’s market from now on. I love trying new food treats! Cool, I love that this peeked your interest. LOVE your handle name by the way. It’s awesome! & Nooshe’ joon in advance!